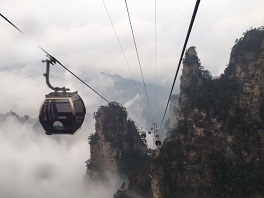 Zhangjiajie UNESCO Global Geopark is located in the Wulingyuan District of Zhangjiajie City, Hunan Province of China. There are four scenic areas in the UNESCO Global Geopark, which are Zhangjiajie, Suoxiyu, Tianzishan and Yangjiajie, with 40 geo-heritage sites of national significance and 12 of international significance in good preservation. Since its establishment, the UNESCO Global Geopark has played a very important role in conserving geoheritage and eco-environment, popularizing geosciences knowledge and enhancing public science literacy.